We wanted to reach out to the community and see what you would prefer! 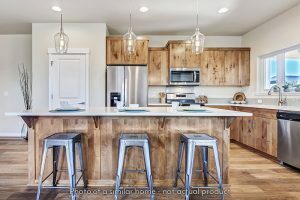 If you are buying a new home, considering remodeling, or just dreaming of the perfect kitchen layout, would you want an island or peninsula counter design? Maybe you already have the perfect kitchen design with just the right amount of feng shui – we want your thoughts too! 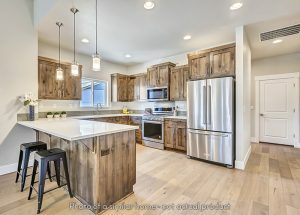 Below are some photos of kitchens in a couple of our new homes in Bend, Oregon. Take a look and tell us what you love, dislike, or maybe wish was different about these kitchens. And, finally, tell us if you’d prefer an island or a peninsula in your new home! 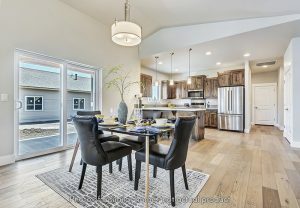 We currently have one of these new homes for sale in Bend which is sure to sell fast! Click here to check out this new home now! Our award-winning cottonwood model is a beautifully designed home, based on Frank Lloyd Wright’s philosophies of indoor-outdoor harmony in living spaces. 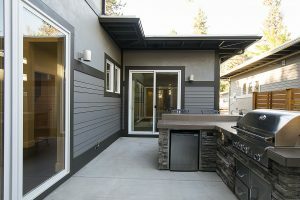 The side patio area has 2 or 3 access points, from the Oregon room (our nickname for the living room), dining room, and master bedroom! It’s the perfect place to entertain and relax on beautiful summer days in Oregon. 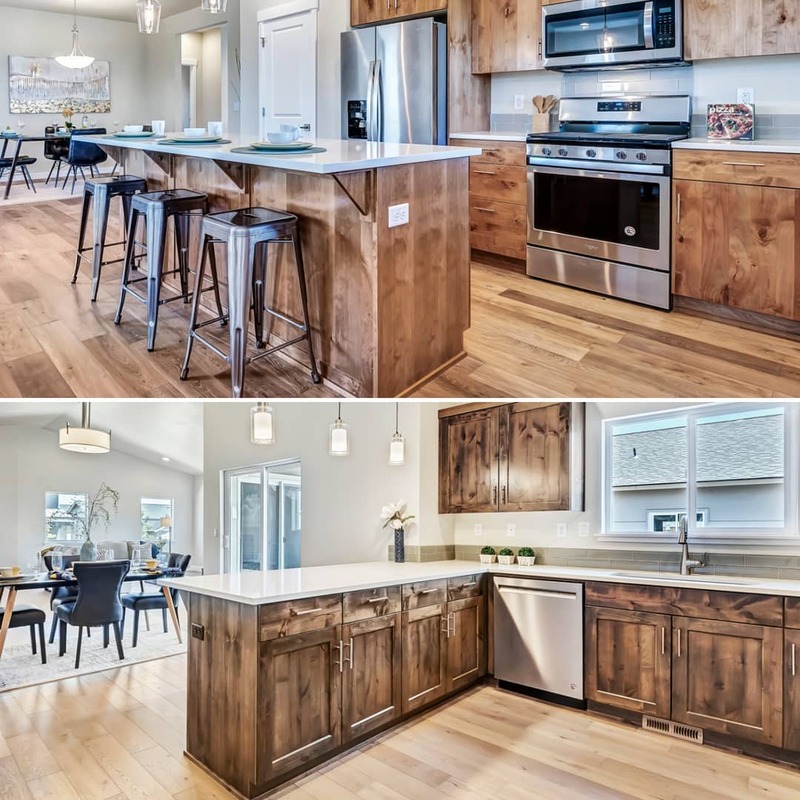 The island in the kitchen features a ledge at which you can use bar stools, and a wide open space for any number of culinary activities! Start making your culinary dreams come true with this beautifully designed kitchen island! In more ways than one, this open-concept kitchen design is amazing! As you slice avocado for your morning toast, take in the natural light provided by the numerous windows in the open living space. 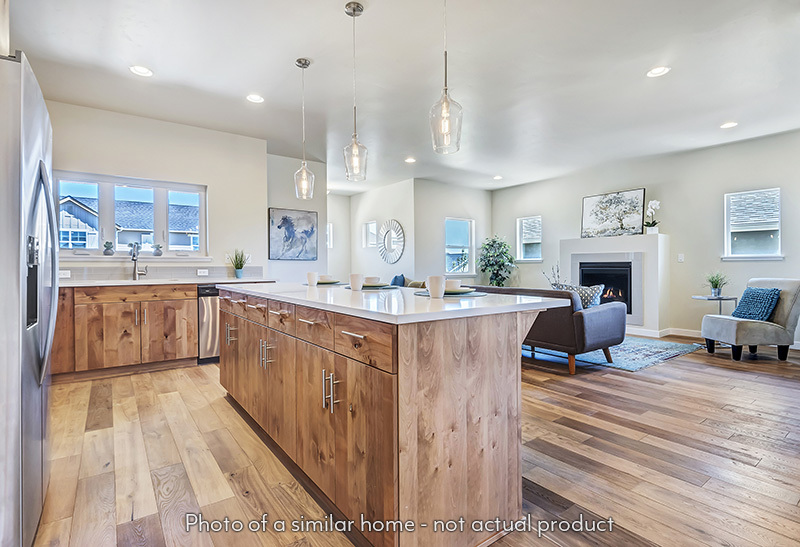 Similar to the cottonwood, this new home is based on open-concept floor plans. Instead of an island, though, this kitchen features a peninsula! 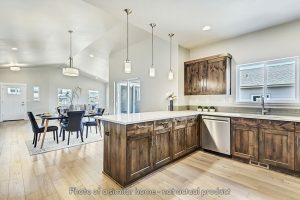 At 1719 Square feet, the Hawthorn model has a smart design and layout that provides a unique but efficient use of space. The kitchen peninsula overlooks the dining area which is connected to the patio/porch area. The Oregon room also has a sliding glass door to the outdoor space, making this a very open living space with tons of natural light. Our interior designer meticulously hand-picks these modern finishes to make these new homes dazzle! 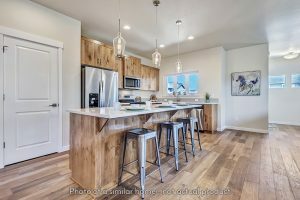 Take a look at those beautiful wood floors! What does your perfect kitchen design include? Island? Peninsula? …A personal chef?